Celebrate mad genius with EPIC tonight! Join us tonight at the EPIC celebration of great creative teams working with worthy non-profit clients. 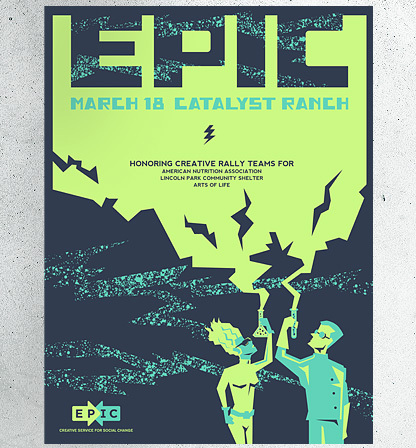 At Hexanine we’re big believers in the mission of EPIC and its founder, Erin Huizenga. Join us tonight at Catalyst Ranch to drink some beer, meet some amazing people, and view the work done for the latest crop of great non-profit clients. Last month we spread the word regarding Font Aid IV: Coming Together, a typeface consisting solely of ampersands. This week, SOTA officially released the font, and we’re proud to be able to say that we’re included. More than 400 designers from 37 countries contributed to Coming Together, and we’re excited to be involved. We submitted two ampersands, both of which are included in the typeface, (one features the Haitian flag, another, just a plain flag). Coming Together is an OpenType font and is being sold for $20 US. It’s available through Ascender Fonts, Veer, FontShop, and MyFonts. All proceeds from the sale of the typeface will go to Doctors Without Borders, to help with their relief efforts in Haiti.